Greetings from ALSA Academic Publication! The Asian Journal of Legal Studies (AJLS) is an open-access and peer-reviewed law journal published by the Asian Law Students’ Association. Founded in 2013, The AJLS serves as an essential academic forum for legal scholars all across Asia. Beyond providing as an academic forum, The AJLS aims to bridge the gap in comparative legal studies within Asia and serve as a prime reference for those within the legal fraternity. The AJLS publishes articles by legal professionals within the legal field with a wide range of legal topics, including in-depth articles and commentaries on the legal practices, comparative studies and legal developments in Asian countries. 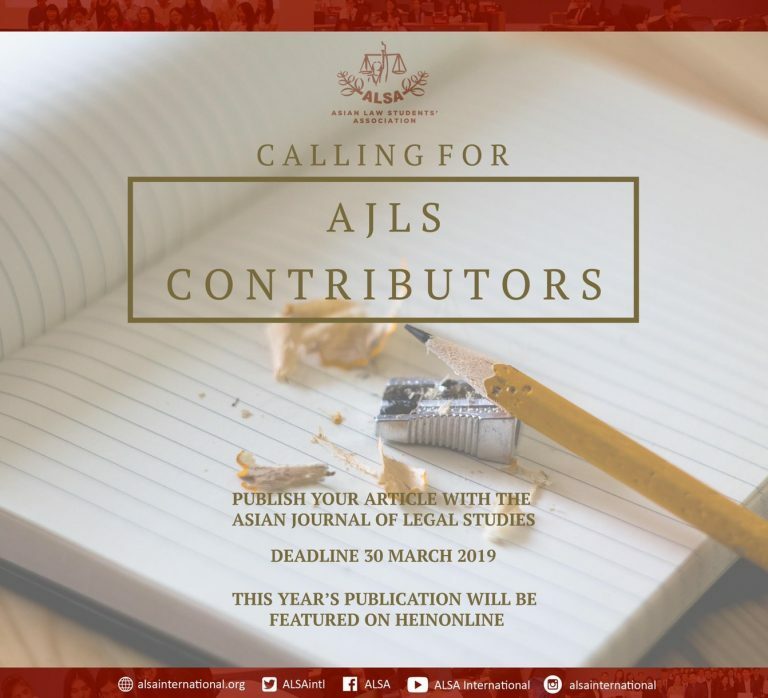 The AJLS is expected to be published annually in July, and will be accepting articles from now until March 30th 2019. It will be published in hard copy form, included in the ALSA Academic Journal, in addition to the soft-copied form available on HeInOnline.